Optimized heatsink layout composed of pure copper for maximum heatsink efficiency. Base Material: Pure Copper. 0.2mm ultra-slim fins for minimized weight and reduced airflow resistance. These fees are non-negotiable. Trending at $38.32eBay determines this price through a machine learned model of the product's sale prices within the last 90 days. Color:Nickle Style:Red LED. - Local pick up is not available. Bearing Type: FSB (Fluid Shield Bearing). Material: Pure Copper and Aluminum. Material: Pure Copper, Aluminum. Speed:Â 1,400 ~ 2,800rpm /- 10%. photo is a representation of one that I have, open. 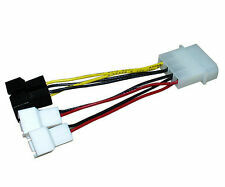 Socket 1155/1156: Core i3/i5/i7, supports all speeds. One of the best air coolers available in my opinion. Comes with all hardware and original packaging. In the picture you can see what this Video Card heat sink is compatible with. Might be unused. Has some scratches and minor bends. See pictures for references. Pulled out of a project that never came to Fruition. Like new unit - no original packaging. Smoke free. Safe shipping. Thanks! 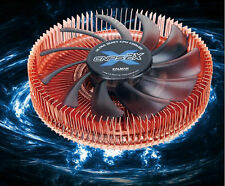 Does not generate noise or vibration in Silent Mode, 92mm fan inside the heat sink maximizes airflow. Pure Aluminum base materials ensure excellent heat dissipation. Silent CPU cooler built with pure aluminum for enhanced performance and optimized compati. 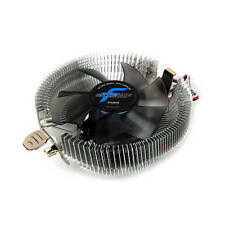 1• Zalman ZF1125BTH DC12V Quiet CPU Cooler. Warranty . Warehouse section 2. 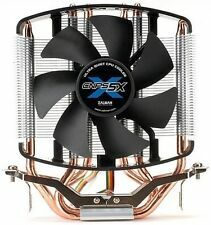 Up for sale Performance Zalman CPU Cooler. Item in great condition, and has been installed using plastic ties(will be included) because it missing a mounting clip. Mounting kit might be purchased separately. Cooler only, item for sale as is. The green LED's within the fan reflect off these polished surfaces to add to the already stunning visual style. AMD Socket 754 / 939 / 940 / AM2 / AM2 / AM3. Dual Fan Support. 132 x 100 x 152mm. 120(L) x 120(W) x 25(H)mm. Max CPU Cooler Height. This CPU fan was taken out of a barley used CPU sitting in my basement. The CPU cooler is intact and comes with the screw's needed to attach it to the motherboard. 92mm 2 Ball CPU Cooling. The item has been tested and found to be in good working condition and good appearance. or for any reason you are not satisfied with the item. the non-working item back. 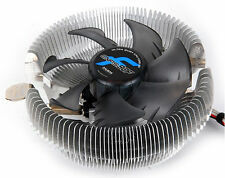 ZALMAN CNPS9700NT 110mm 2 Ball Low-noise CPU Cooler For Intel & AMD CPU.New in box.Recommended by Nvidia. Compatible with: All Intel socket 775 CPUs. All AMD socket AM2/754/939/940 CPUs. Fast SHIPPING. FM2 Trinity 82W or lower. AM2 Athlon FX 82W or lower. AM2 Athlon FX 82W or lower. AM3 Zambezi 82W or lower. AM3 Athlon II 82W or lower. Socket CPU CPU Compatibility. Base Material Pure Aluminum. Weight 198g. Open boxes item, never used, all parts accounted for carefully. Zalman PWM. Socket 775. CPU Cooler Fan. We will try our best to resolve the issue. the non-working item back. I ordered from zalman, bought two, one for a spare, never needed it. 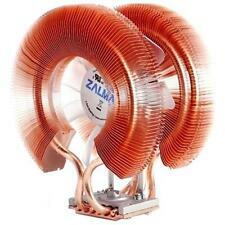 Zalman Ultra Quiet CPU Cooler with Heatsink. 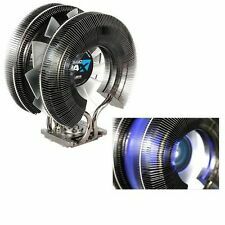 High intensity Blue LED Fan. Grab The Best Deal! The cooler`s installation requires an unobstructed space of 85mm(L), 127mm(W), and 134mm(H), with the CPU as a central reference point. DTH technology transfers the CPU`s heat directly to heat pipes, thereby minimizing heat resistance and maximizing cooling performance. AMD Socket 754 / 939 / 940 / AM2. Clip-B for AMD64. Clip-A for AMD64. Backplate for Socket 775. Cable for FAN MATE 2. Thermal Grease. AMD Athlon 64 X2 (Socket 939), and AMD Sempron/AMD64 (Socket 754/939/940). Condition is New. AMD Socket: 940. Dual-Core Opteron. AMD Socket: 939. AMD Socket: 754. Pentium Dual Core. Core 2 Duo. Core 2 Quad. ‣ Monitor Mounts. OutletPC was founded in 2001 and since then we've been focused on getting people around the world great deals on computer products, systems, and hardware. We've built a great selection over the years of all types of PC parts you can choose from to build, upgrade, or buy a desktop or laptop. 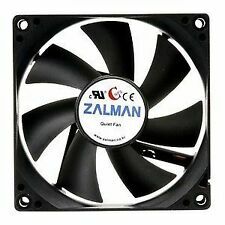 Zalman's CPU Coolers do not generate noise and vibration in Silent Mode. The heat dissipating material of the Flower Heatsink (FHS) is Pure Copper. Separation of the FHS from the CPU fan prevents transfer of the fan's vibration to the CPU. Fan connector 4-pin (PWM). CPU socket compatibility Socket LGA1156, 1366, 775, AM2 , AM2, 754, 939 and 940. AMD CPU compatibility Phenom, Athlon 64 FX/X2 Dual Core, Athlon 64, Opteron, Opteron Dual Core, Sempron.